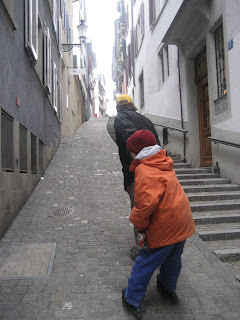 I am spending three days in Zurich with my Uncle Bill (you will recall this is the uncle I went to visit when my passport was stolen when I was your age), my Aunt Carmen, and cousins Sam and Aleksander. Teacher has brough them abroad, as my Uncle is a middle school history teacher at the Zurich International School. Yesterday, I went into school with him, spoke with a few classes (and showed them out blog), and got to meet his students and fellow teachers. 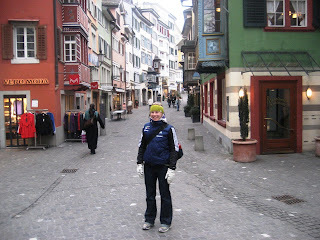 This afternoon, I got the tour of Zurich, and tomorrow's main activity is watching my Aleksander's hockey practice. A taste of normal life outside of sport has been refreshing. I've enjoyed the different schedule, bed, and environment. It is hard to capture one city in only a few photos - so I downloaded as many as I could. Enjoy! 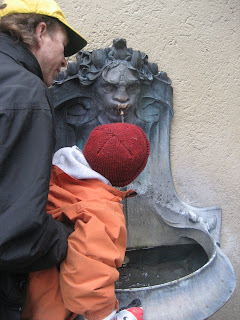 Fountains like this can be found everywhere throughout the city, and Switzerland. Aleksander alternated between my water bottle and these fountains while on our walk today. 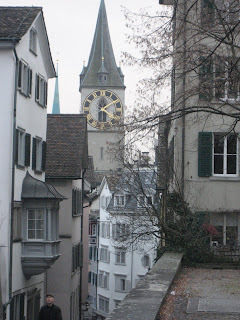 The Gros Munster - one of the largest cathedrals in Zurich. 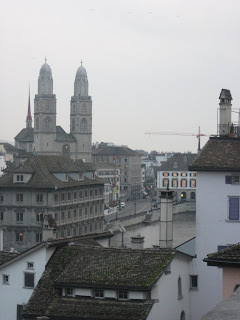 It is built upon the graves of two of Zurich's patron saints. 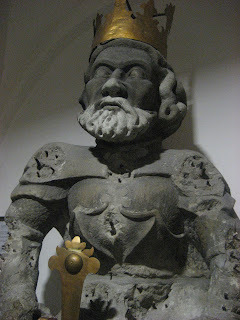 This is a statue of Charlemagne, found in the inside of the Gros Munster. 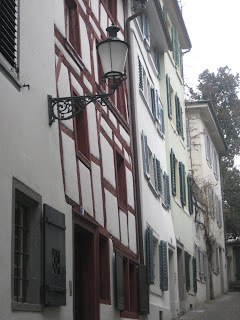 I really enjoy the architecture of Europe and the unique features that distinguishes these older cities. The doors, the windows, the rooves and gables, the cobblestone streets, the carvings, statues, the churches, the parks and gardens, walkways and public trams and trains, are unlike any I have seen in the US. Sometimes I take photos of people, but mostly I gravitate towards the details you find when you look at the ground level, and at the buildings around and above; I could take pictures of these features all day. Aleksander, Bill and I played a game of outdoor chess. Well, I should say I watched Bill and Aleks play. 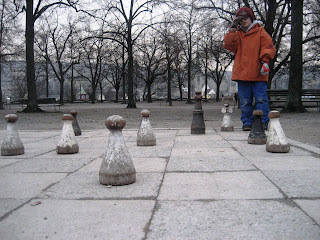 I am new to playing chess, but regardless playing outside with oversized pieces in a public park is pretty cool. I was in Italy during Pres. Obama's Inauguration and but his presence is clearly felt where ever we travel. 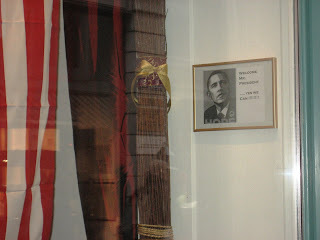 The framed photo says "Welcome Mr. President. Yes We Can!" 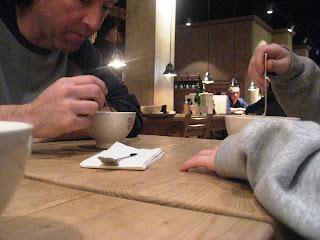 We ended the afternoon at a cafe for some hot chocolate. Winters in a city are cold and damp, and this hot, hot chocolate never tasted so good. On Friday I will take the train to meet up with my teammates in Munich, Germany. Saturday morning, training resumes as I prepare for World Championships in 2 weeks. Until then, I have another day of R&R and hanging out with family. 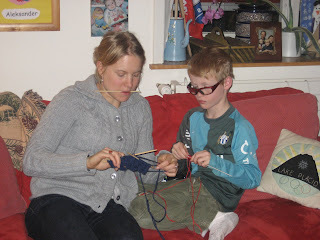 Aleksander and I knitting in the evening. My third week of racing was spent in Italy, and because it is one of the most beautiful places that I get to ski I wanted to share some images with you. Looking up to the mountains from a sharp turn on the race course. On our final day, a few of us went for a long classic ski up towards a pass above the biathlon venue. If we continued on to the top, after passing this cabin, we would reach the mountainious border of Austria. The classic ski up was fun, but it would have been a lot more fun to take one of these sleds back down the trail. Alpine sledding is quite popular here, and often in these mountain towns you can find sleds for rent at the bottom go these trails. On an afternoon run on the ski trails. A view of the Olympic ski jumps, looking up from Platform 3 at the Innsbruck trainstation while waiting for my train to Zurich. A nice view of the Alps from the center of the city. I am standing on a bridge that crosses the Inn river. Looking down the Inn valley that flows through the city. "Goldenes Dachel" - The Golden Roof. This is a famous site to see in the center of the old town. This photo does not do it justice, but the roof shingles are beautifully gilded and are glowing in the morning light. 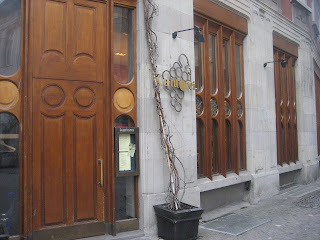 Daily bread: small baguettes, rolls and pretzels, some called brioches are more common than sliced bread for sandwiches. I hade a great week in Antholz, Italy. Perhaps, it is becoming one of my favorite places to ski. The sprint race was okay. 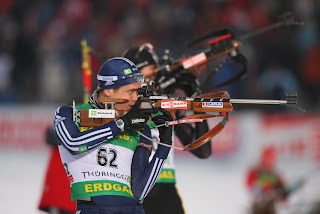 I am still struggling with shooting, and am looking forward to three weeks off from racing to get back into training. 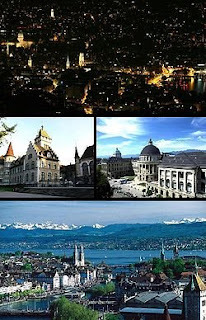 But, before I do that, I am going to spend the week in Zurich, Switzerland with my aunt, uncle and two cousins. Hope all is well in Placid! "Sometimes you have to reach the bottom before you can reach the top"
This quote caught my attention when I was reading some comments from the women's sprint race. At the moment I feel a bit like I've hit the bottom with my shooting, and am looking up, starting tomorrow, to head back up to the top. I had a tough shooting race on Friday. I skied very well, and am quite happy with that. I should have reminded you to watch because I guess the Americans were shown quite a bit that day - especially after the hype of our successful men's team and Lake Placid was mentioned. But back to shooting, it is a bit of a riddle to me right now that I need to figure out. 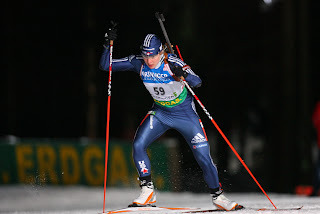 Tomorrow I will do a "pursuit race" by myself with five ski loops and 4 shooting stages. I've got a few clues after talking to my coach and spending some time breakdown my racing shooting experience, and I think I can figure it out because I've only got 20 shots tomorrow to do it. As for today, I took a relaxing ski along some lakes this morning with my teammate, Lanny. This area actually reminds me of both the Cascade Lakes and Chapel Pond area - but instead, with lots of ski trails and quite a few skiers out to enjoy the sunshine. Hope all is well in Placid! Lanny on the "Seeloipe" - lake loop. The US Men's team after their 5th place relay finish in Ruhpolding. All of the other characters are our coaches, team leader, wax technicians, ski grinder and massage therapist. 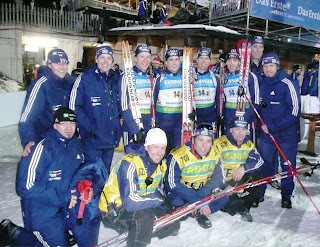 On Monday, my teammates and I traveled south from Oberhof to Ruhpolding. Deep in southern Germany, Ruhpolding is on the cusp of the Alps. Our hotel sits below Raushberg, a 1670m mountain with a tram that runs to the top. This is another low snow year, but the towering rocky mountains look just as majestic. I took a jog this morning around 10 am along the river near our hotel and people were already starting to walk to the venue, some 5km from town. Looking down into the Ruhpolding valley. My teammate, BethAnn and I watching the race in 2006. One of the jumbo screens featuring the shooting range, and here retired Frenchman, Poiree. A view through the tunnel and up to, what is referred to as the “wall.” Aptly named, because it is so steep! It is another enjoyable week here. As I type, I am watching our men’s relay team race to their best finish ever! They were 9th in the Olympics in 2006 in Torino, Italy. They have worked hard to get back to that standing ever since. Lowell Bailey, “scrambled”, started the relay for the team and by the time Tim Burke handed off to the final leg, they were in 4th!! All of our parents have become pretty computer savvy and have been up to watch our races online, like you did, at home. Tim’s parents even host “biathlon breakfasts.” They ended with a victorious 5th as Jeremy Teela, the final leg crossed the finish line. My Sprint race is on Friday at 2:30pm. It is exciting to be on such a successful team, and I hope to carry on this momentum in my own race. Ciao! This is the view headed down to the course and start area. You can see the crowds filing in and filling up the stands, and the range in the background. During the race, this where I would go to get to the start. Notice the crowds above on the left, and on the right a line of skis and ski testers preparing for the upcoming race. Part of the course and stands prior to Sunday’s Men’s Mass Start. 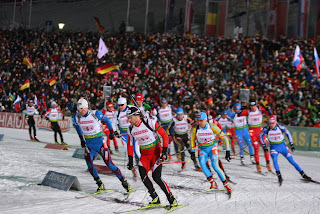 The Mass Start races are pretty exciting to watch because only the top 30 best athletes start. It is the best of the best battling it out. One of our US waxrooms. In each location we get one or two wax rooms. They are usually the same size, if not a bit bigger than the NYSEF wax room at Mt. Van Hoevenberg. My race skis. I have a small stock at the moment, and here they are ready to travel to the next venue with our wax techs. I work with the team's wax techs before each race to figure out which pair will be the fastest pair for the course and snow condition. I admit, the race atmosphere is fun in the beginning, but to really get to watch the good parts of the races, the view from my bed of the TV is best. These shots are during the men’s Sprint race earlier this week. Here a Swede (another Johnson) just finished his standing stage. At the bottom of the screen you can see two of our American men in the standings – Jay Hakkinen and Tim Burke. These close shots offer a great view of some of the best shooters, their style, their speed and precision. Here is a short clip of a young German on the “big” hill on the course. You can see the exuberant crowd behind him the whole way. 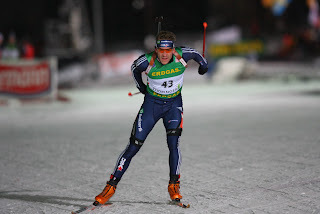 I really enjoyed racing in Oberhof this week and look forward to next year. I did not shoot that well, but was happy with my skiing. It leaves me with some important steps to improve upon in the range and motivation to continue to progress on the ski tracks. I’ve been the only US woman here this week, but will be joined by one more for the 5th World Cup in Ruhpolding, Germany, and a full team of 5 for the 6th in Antholz, Italy. 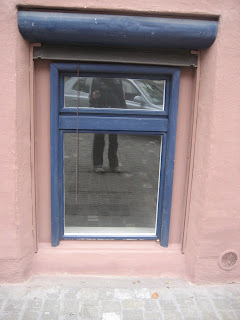 This is the first of many weeks in surrounded by the German language, which I promise to myself to learn at some point. 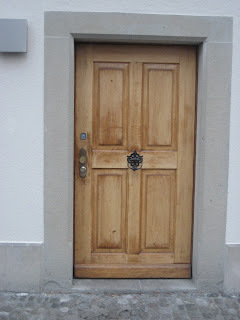 For right now, I can be polite: danke = thank you, danke shon = thank very much, and when I really need to express it, vielen danke = thousand thanks, bitte = please, and my room number zwei-hundra-seiben = 207. 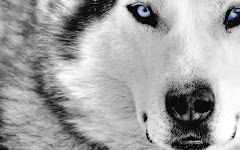 Take care and I will post again next week.